Gwili Steam Railway Steam RailwayThe Gwili Steam Railway operates a standard gauge preserved railway from Bronwydd (near Carmarthen) in south-west Wales along a short section of the former Carmarthen to Aberystwyth railway that closed for passenger traffic in 1965, the track being lifted in 1975. The Gwili Railway was formed in 1975 and, by 1978, had purchased and rescued about eight miles of trackbed and was running an initial steam-hauled service on a one-mile section of it. The Gwili Railway has the distinction of becoming the first standard-gauge preserved railway to operate in south-west Wales when it re-opened this section of the Carmarthen-Llanpumsaint route from its base at Bronwydd Arms, three miles north of Carmarthen. Since then, the railway has expanded to Danycoed and the company continues to hope to expand to Llanpumsaint. The Railway has been working south towards Carmarthen to a new station called Abergwili Junction - a branch that ran for 12½ miles to join the Heart of Wales line at Carmarthen Valley Junction to the south of Llandeilo. This 1.75 mile extension increases the route length to 4 miles and it opened on 1 July 2017. The new line follows the picturesque River Gwili, passing alongside the 'Gwili Falls', where the river tumbles over rocky outcrops. These views have not been seen by the travelling public for nearly 50 years. The Gwili Steam Railway operates a standard gauge preserved railway from Bronwydd (near Carmarthen) in south-west Wales along a short section of the former Carmarthen to Aberystwyth railway that closed for passenger traffic in 1965, the track being lifted in 1975. The locomotive stock of the Gwili Railway is unusual in that it mostly represents local industrial and wartime operations rather than mainline services. 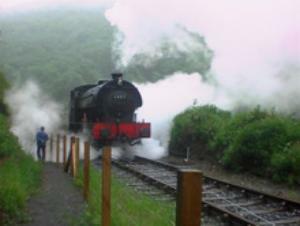 Join the train at Bronwydd Arms Station and take a trip into the past, on a living and growing full-size steam railway. Enjoy the beautiful Gwili Valley, relax alongside the river for a picnic, walk the woodland walk, ride the miniature railway, and absorb the nostalgia of bygone days. Refreshments and toilets available. Rail Route: Bronwydd Arms to Danycoed (2.5 miles) & Abergwili Junction (1.5 miles). Also open November 30; December 1, 7, 8, 14, 15, 21, 22, 23. Only open for 12:30 Sunday lunch trains on April 28, May 19, June 16, July 7, September 15 & October 6. Diesel services on April 13, 14, 27; May 11, 12, 25; June 1, 8, 29; July 13, 20, 27; August 3, 10, 17, 24, 31; September 7, 8; October 12, 13, 19, 20, 26, 27; November 2, 3. Steam all other operating dates. Standard timetable departures from Bronwydd Arms at 11:00, 13:00 & 15:00; see events for times. 2019 Standard Service Fares: Adult £12.00, Senior £11.00, Child (3-15) £6.00 (under 3 free), Family (2 adults & 2 children) £31.50. Prices are for normal services; special events and dining events have different fares.